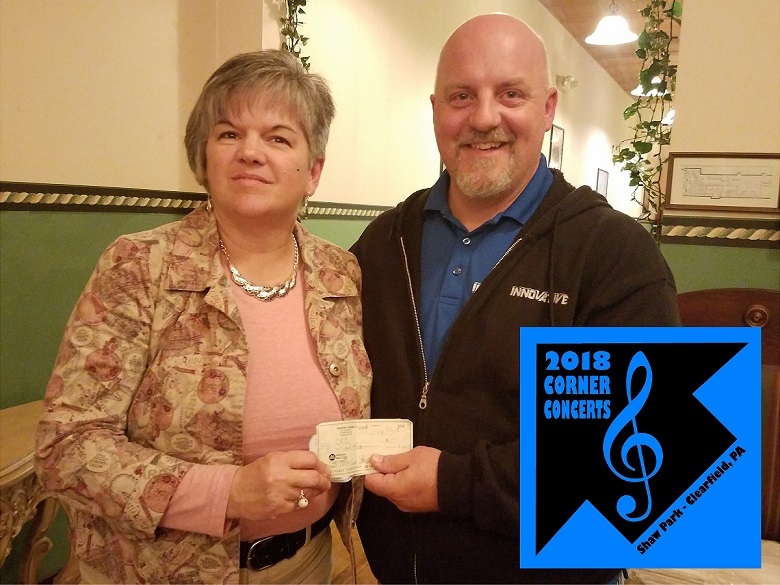 CLEARFIELD – Steve Albert, organizer and host of the Corner Concert Series, recently presented a check for $620 to Main Street Manager Loretta Wagner. Clearfield Revitalization Corp. (CRC) was the recipient of donations collected at the Corner Concert Series over the summer. All donations are split between the weekly performers and a local non-profit organization. Visit www.discoverclearfield.com for more information about the CRC. Albert would like to thank all the performers and those who attended every Friday night from Memorial Day through Labor Day at the Shaw Park in downtown Clearfield. “It was another successful summer,” he shared. According to Albert, a non-profit organization has not yet been chosen for the 2019 season. However, Albert will start booking performers for next season sometime after the beginning of the new year. For more information about the Corner Concert Series, please like its Facebook page.